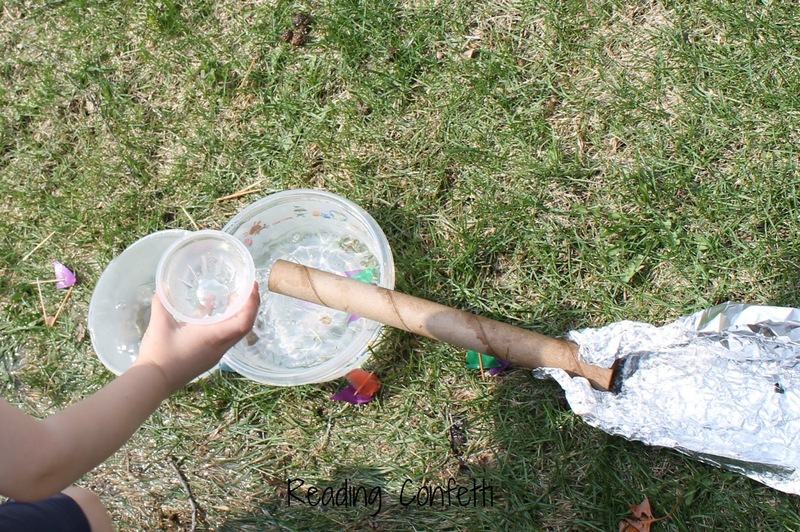 My kids love playing with water when the weather gets warm. It can keep them busy like almost nothing else. 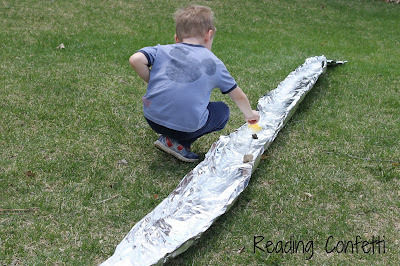 When I saw these tin foil rivers at Camo & Bows, I knew we had a winner. I made a smaller version of our natural ice boats to float on the river. 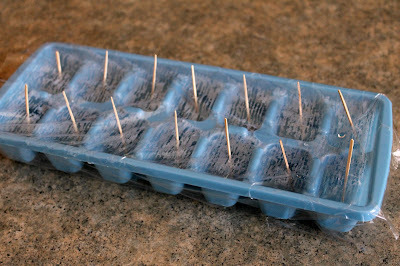 I filled some ice cube trays with colored water, covered them with plastic wrap, and poked toothpicks through. 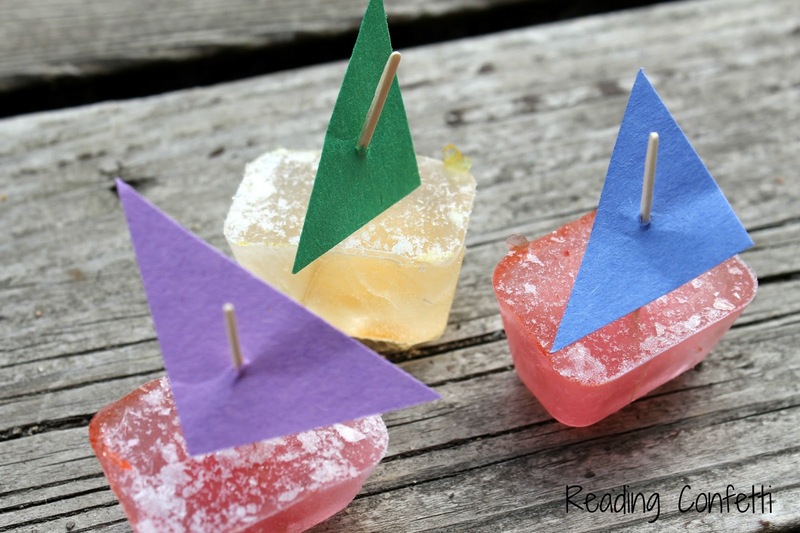 Back in the olden days, we used to make Kool-Aid popsicles this way. When they were frozen I added some little paper sails. The river part of it was equally easy. I used the cheap aluminum foil from the dollar store. 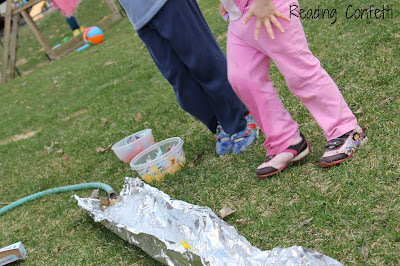 Just unroll it, curl up the sides a little, and start the garden hose. It doesn't need to be a great big hill, but a slope is definitely helpful. Even when the ice boats melted, they found other things to float and built some waterfalls. There's talk of adding a bridge tomorrow. A great book to pair with this activity is Where the River Begins. As they watch the river flow past their house, Josh and Aaron make up stories about where the river begins - stories that prompt them to set out to discover the river's origin. *Disclosure-This post contains affiliate links. Cute idea! Pinned. Hopping over from Tuesday Tots. Love this idea! Definitely something we'll have to try soon - maybe this week! That looks like so much fun! The book sounds interesting too, must see if I can find it. Great! I can't wait to try this with my niece & nephew (4 & 7 yrs old). I just went to Amazon and bought the book as well. Thanks for sharing! LOVE these! Featured these on this week's Sunday Showcase & pinned to our Pinterest board. They look so fun!